Nintendo has finally freshened the air in sales of their 3DS gaming handheld. 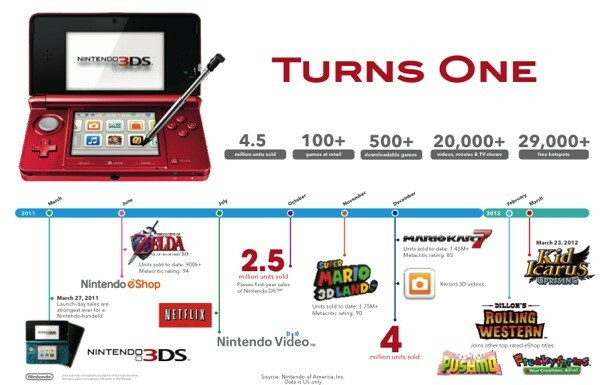 A flat number of $4.5 million units have been sold, surpassing the 2.3 million classic DS units sold between 2004 - 2005. Worldwide sales? Current sales are not spoken, but it is known that Nintendo has surpassed 5 million units. But for full info, check out the press release below. "Nintendo 3DS closes its first year with a lengthy list of accomplishments but we're still just scratching the surface," said Nintendo of America President Reggie Fils-Aime. "With a massive lineup of first- and third-party games and more on the way, a budding library of entertainment options and an engaged and growing installed base, Nintendo 3DS has an incredibly bright future. We're just getting started but this platform is built for the long haul."